Mompreneurs are some of the most hardworking and passionate in the field of entrepreneurship. There are some who do a remarkable job of balancing home and work life, while creating waves in her industry through knowledge and skill, brilliant strategy, resourcefulness and a whole lot of heart. Don’t let her efforts go unrecognized. Vote for your most admired mompreneur in the first ever Mompreneur Awards! The nominee must be an active mom with a successful business. She should have been actively engaged in her business for at least 1 year from July 2013. She should personally own the business, or be part owner thereof, and play an active part in its operations. Nominations can be done by any individual as long as he / she has the required information needed to complete the nomination form. Nominations will be accepted until 11:59pm of August 21, 2013. Incomplete nomination forms will be deemed invalid. Nominations have been extended to August 24, 2013. All information gathered will be kept confidential. The organizers reserve the right to conduct further research to verify information submitted through the nomination if necessary. All submitted forms will undergo careful evaluation by the organizers and panel of judges. After evaluation, shortlisted nominees will be asked to submit supporting documents such as DTI and/or SEC articles of incoporation, and also answer essay questions, which will form part of credentials for the evaluation of her nomination. Failure to comply with requirements may result in disqualification. The list of shortlisted nominees will be deemed semi-finalists and names will be posted on the Mompreneur Manila website and Facebook page and go through public voting starting August 27 and ending on September 10, 2013. 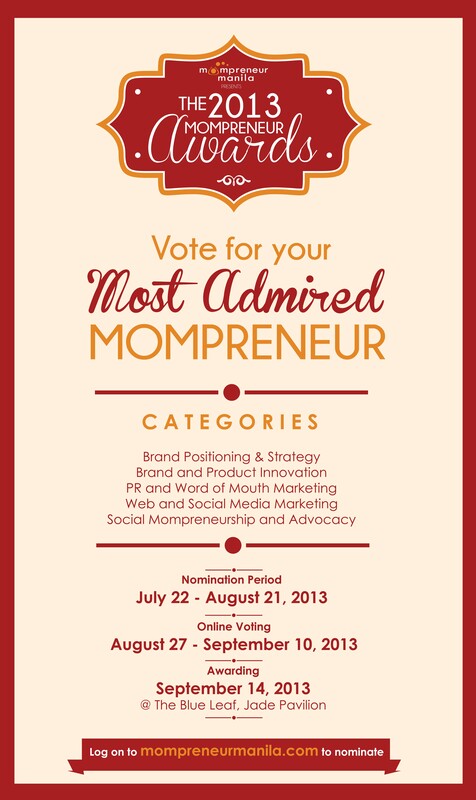 Nominate your most admired mompreneur by filling up the Nomination Form embedded below. Click “Continue” to submit your entry. Nominations are now closed and voting has started. View the final nominees here. Attend the awarding ceremony of the 1st Mompreneur Awards. Register for the Mompreneur Summit here.